Based in Palmerston North we form part of a worldwide Im-Press Promotions network. 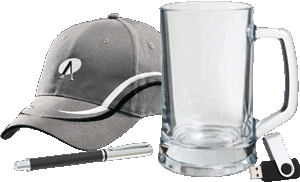 Through this network we can source an extensive range of quality, competitively priced branded merchandise. Our objective is to provide the best customer service at all times, supported by trusted quality products. Im-press Promotions specialise in assisting companies and organisations maintain their profile in the market place. On a day-to-day basis, we are dealing with almost anything that can be branded, whether its ideas for conferences, fundraising, celebrations, or simply getting your name out there. The list of products is endless. On top of this, we provide a range of branding ideas/methods, making your purchase that little bit more special. If you don't need the product branded, that's fine, we can supply unbranded product too. And all the rural centres. Basically anywhere in New Zealand. We pride ourselves on being able to deliver a quote on almost any product you may be considering. If you have an item in mind please, give us a call and we will do what we can to find the product, and provide options and numbers for you to peruse. Please take this opportunity to browse the rest of our website, and if you don't see what you are looking for or if you have any questions.......just contact us. It's what we're here for.